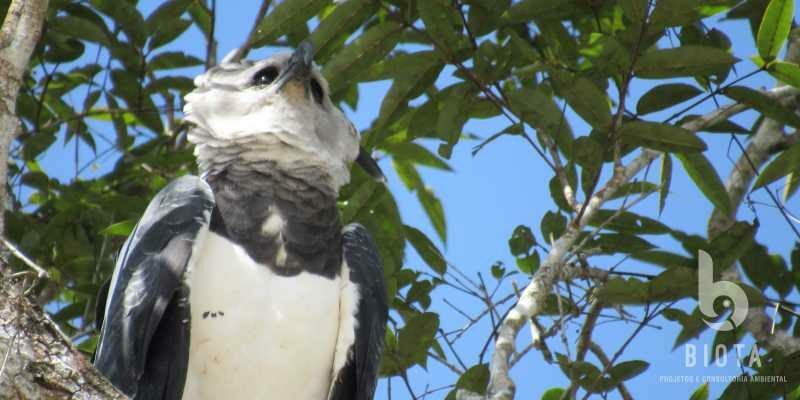 In the Brazilian Amazon, two monospecific genera, the Harpy Eagle and Crested Eagle have low densities and are classified by IUCN as Near Threatened due to habitat loss, deforestation, habitat degradation and hunting. In this study, we evaluate occurrence of these large raptors using the environmental surveys database from Belo Monte Hydroelectric Power Plant. Integrating the dataset from two methods, we plotted a distribution map along the Xingu River, including records over a 276-km stretch of river. Terrestrial surveys (RAPELD method) were more efficient for detecting large raptors than standardized aquatic surveys, although the latter were complementary in areas without modules. About 53% of the records were obtained during activities of wildlife rescue/flushing, vegetation suppression or in transit. Between 2012 and 2014, four Harpy Eagles were removed from the wild; two shooting victims, one injured by collision with power lines and one hit by a vehicle. Also, seven nests were mapped. The mean distance between Harpy Eagle records was 15 km along the river channel, with a mean of 20 km between nests near the channel, which allowed us to estimate 20 possible pairs using the alluvial forest, riverine forest and forest fragments. Territories of another ten pairs will probably be affected by inundation of the Volta Grande channel, which is far from the main river. The average distance between Crested Eagle records was 16 km along the river channel. The only nest found was 1.3 km away from a Harpy Eagle nest. The remnant forests are under threat of being replaced by cattle pastures, so we recommend that permanently protected riparian vegetation borders (APP) be guaranteed, and that forest fragments within 5 km of the river be conserved to maintain eagle populations.